Since May, 2017, Yi Xin Kang Pharmacy in Zhengzhou have been using the "Intelligent Pharmacy" system for one year. 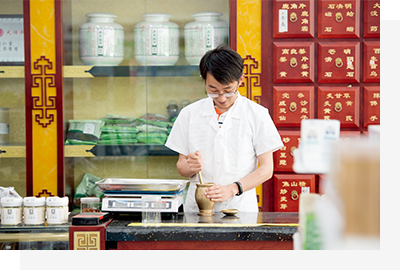 As the owner of the Pharmacy, Zhang Zhifei likes the system so much that he recommends it others whenever possible. Last week, when he was discussing the changes in the medical insurance system with his friend in the friend's pharmacy, he wanted to check the information of several drugs in his friend's computer system. However, he found that the procedures were too complicated. Therefore, Zhang Zhifei immediately recommended the "Intelligent Pharmacy" system that he had been using. The friend contacted with CR Henan Pharmaceutical and had the system installed the following day. This is the third pharmacy that has installed the "Intelligent Pharmacy" system at Zhang Zhifei's recommendation. He has become a voluntary promoter of "Intelligent Pharmacy". Zhang Zhifei comes from Inner Mongolia. Now, working and living in Zhengzhou with his family, he has totally blended into the local community. Having worked in the medicine logistics and pharmaceutical industry for nearly a decade, Zhang Zhifei accumulated much experience and personal connections. In his 30s, he decided to establish his own pharmacy. Since then, he has been closely cooperating with Cr Henan Pharmaceutical. In recent years, the Chinese government accelerated medical reform to make healthcare accessible and affordable. Under the influence of policies such as "the separation between prescription and dispensing, zero medicine makeup and hierarchical medical system" the retailing drugstore market has been developing rapidly. Drugstores providing direct service to patients, are playing an increasingly important role. However, there are also problems: most of the drugstores are small and distributed and there is a lack of skilled employees. So, how to use technology to break down the constraint of time and space to establish a comprehensive industrial chain has become an imperative task for CR Henan Pharmaceutical. Zhang Zhifei was among the first batch of drugstore owners installing the "Intelligent Drugstore" system after it was officially launched. The trust he has for CR Henan Pharmaceutical as a result of many tears of cooperation is not the only reason for him to make the choice. What impressed him most is rich new drugs and drugs for special use in the "virtual inventory" and future position and deployment. In the early stages, technical staff from CR Henan Pharmaceutical visited Yi Xin Kang Drugstore for multiple times to provide training to employees, answer their questions and upgrade and optimize functions according to the need of customers. Such considerate service helped to integrate the management of the system and drugstores. Yi Xin Kang Drugstore specializes in new drugs and drugs for special use. However, due to capital, validity period and inventory constraints, the type and amount of drugs being sold are hard to meet the demand of patients. In the past, when people came to buy drug that the drugstore didn't have, the clerk had to say, "I'm sorry that you have to go to other drugstores because we don't have the drug", which would usually make the patients disappointed. However, with the "Intelligent Drugstore" system in place, clerks could conduct real-time search for the inventory of a certain drug in CR Henan Pharmaceutical on the "Virtual Inventory". Once being confirmed that a certain drug is available, the clerk could negotiate with the customer on the time of drug delivery. Customers could choose to go to the store to fetch the drug or get it delivered. Currently, the drugs are dispatched and delivered by CR Henan Pharmaceutical and could reach the drugstore within one day after an order is placed. Zhang Zhifei's drugstore is very close to CR Henan Pharmaceutical. It takes only half an hour for him to get the drug. Zhang Zhifei is satisfied with the system, "it helped me to meet the diversified need of consumers and improve customer experience. Now, we have many loyal customers". In early 2018, Zhang Zhifei decided to develop Yi Xin Kang into a drugstore chain. Drugstore chains need to assign employees of different positions with different authorities in the online information system. Therefore, CR Henan Pharmaceutical identified authorities for each position and deployed a system upgrade on the basis of the drugstore chain structure embedded in the "Intelligent Drugstore" system. Moreover, technical staff from CR Henan Pharmaceutical also made a detailed explanation document and on-stage presentation to help Yi Xin Kang to get the approval from the Drug Regulation Administration. Now, Zhang Zhifei has got the Drug Business License for the operation of drugstore chains. Of course, the reform that allows patients to get prescription from hospitals and buy drugs from drugstores gives Zhang Zhifei the expectation that "Intelligent Drugstore" system could integrate with hospital prescription. Yi Xin Kang Drugstore specializes in new drugs and drugs for special use. However, such drugs could only be bought with hospital prescription. Therefore, Zhang Zhife believes that selling these prescribed drugs has huge potential in the future. By the end of 2017, "Intelligent Drugstore" system has been adopted by 570 stores of 127 drugstore chains across Henan Province, providing comprehensive, highly-efficient and concrete support for the smart management of small-andmedium-sized drug retailers in Henan. As an important link between drug production and retailing, the integrated development of drug distribution is an inevitable trend. 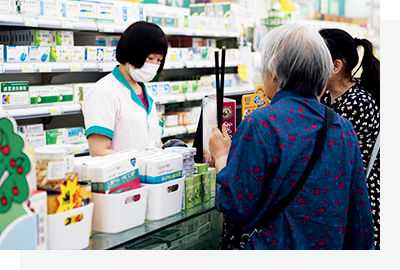 CR Henan Pharmaceutical regards small-and-medium-sized drug retailers as both strategic partners and its own "virtual drugstores" through the development of "Intelligent Drugstore". In this way, it established a "brick and mortar drugstore + virtual drugstore" chain model that could meet the need of the pharmaceutical industry and optimize the network of self-owned drugstores, which is significant to improving the overall market share and competitiveness of CR Henan Pharmaceutical. In the future, CR Henan Pharmaceutical will realize networked operation and management of drug retailers with "intelligent drugstores" as service centers to realize the interconnectivity of all drugstores and develop a comprehensive service chain integrating drug producers, hospitals, drug retailers and patients with "healthcare service for patients" as the priority, so as to realize "smart health". "Healthcare for all through jointly building and sharing medical resources" is our common goal. CR Henan Pharmaceutical has always been committed to promoting the implementation of the "healthy China" strategy with a strong sense of gratitude and responsibility to carry out its social responsibility to the nation, the industry and patients, promote sharing, shared prosperity and win-win cooperation along the pharmaceutical industrial value chain and benefit people's health and well-being. Most of CR's business operations are faced with huge market competition. Therefore, each step forward needs the support of partners. For a long time, CR has been attaching great importance to communicating and cooperating with partners and expanding its cooperation with governments, businesses and research institutions through strengthening strategic sharing mechanisms and platform construction to realize common development. 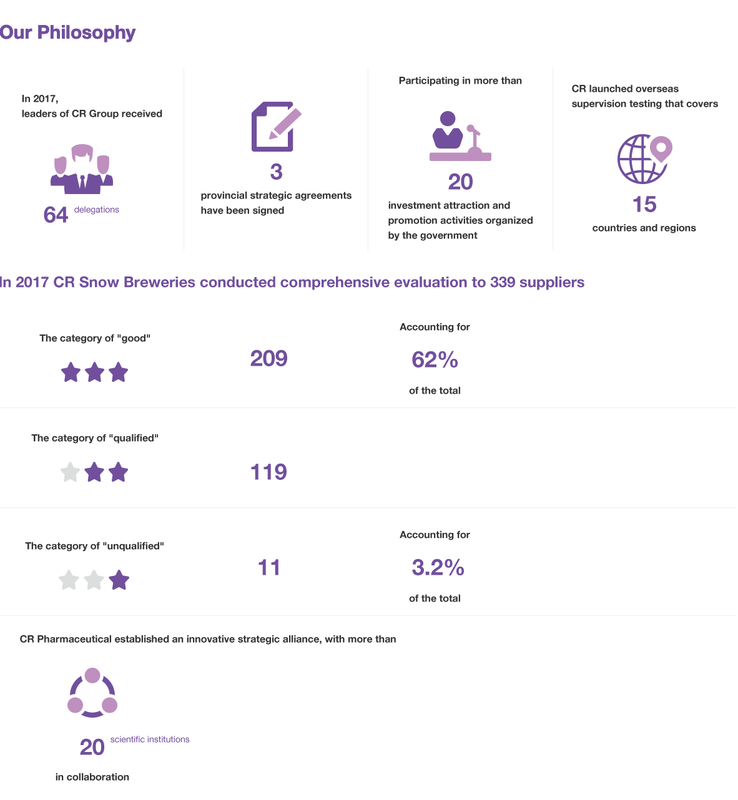 Through pinpointing the "pain points" of suppliers and industrial peers, CR shares experience and insights with the rest of the industry to create new opportunities for win-win cooperation in virtuous competition. By establishing the anti-corruption mechanism along the supply chain, CR advocated the importance of social responsibility and business ethics to safeguard market rules, improve the competitiveness of the supply chain and create a favorable environment for doing business. For CR, each step forward is the result of the close collaboration with partners. The era of the internet provides new opportunities for value creation and capture for every participator of the commercial ecosystem, where competition and cooperation could both promote new business progress. CR attaches great importance to communicating and cooperating with governments, suppliers, customers, research institutions and other partners to discover and take new opportunities, promote the healthy development of the industrial chain and strive for win-win collaboration through understanding their priorities and expectations for CR. In the future, we will continue to hold good business ethics, safeguard market rules, contribute new ideas to promote business development, maintain a good relation between government and businesses and jointly build a favorable environment for doing business together with our partners for shared development.